New Zealand’s prime minister has said she is “ready and willing” to sign a post-Brexit trade deal with the UK. 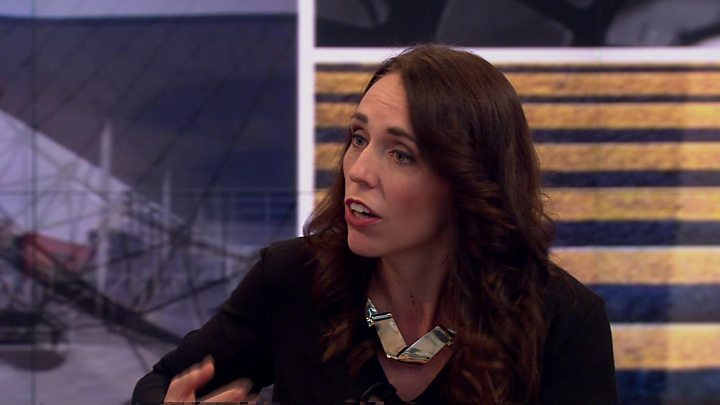 Jacinda Ardern said negotiating a free trade agreement would be a “real priority” once the UK had left the EU. She is meeting British Prime Minister Theresa May before heading to the World Economic Forum in Davos, Switzerland. New Zealand says it imported £1.41bn in goods and services from the UK in the year to September 2018, sending £1.54bn of trade in the opposite direction. That accounts for about a third of its trade with the EU as a whole. New Zealand is negotiating a free trade agreement with Brussels and Ms Ardern said she would be promoting the talks while visiting Europe. She said it was an opportunity to stop in London during a “very unsettled period” to emphasise her country’s long and deep ties with the UK. “As a very important trading partner for us, at the point the UK is ready to do so, we’re very keen to enter into a free trade agreement,” she told the BBC’s Victoria Derbyshire programme. Ms Ardern, who heads New Zealand’s Labour Party, said she hoped a future deal could prove the “gold standard” for free trade agreements, with a focus on labour and environmental standards. She said she did not want to comment on British politics but described Mrs May as “a woman of remarkable resilience”. Asked about the consequences for New Zealand of Britain leaving the EU without a withdrawal agreement, Ms Ardern said it would “impact on just about everybody… in particular, small business”. “A no-deal scenario would be very, very difficult,” she said.